You may think that since I wrote a book on Spanish tools and speak it well enough to have a few Mexican friends, my days are seamlessly spent moving from one conversation to another. Ja-ja (ha-ha). Although my Skype language practice partners in Spain compliment me on my usage and vocabulary, huge swaths of conversation pass between my Mexican girlfriends and me where I don’t have a clue what they’re talking about. Mexicans, especially the women, talk fast. They emote. It’s a lot to take in at once - the words, the emotion, all while trying to determine what they need and expect from you. Throw translation into the mix and you’re in for an evening of adventure, all without even leaving your living room. You can count on your Spanish to contribute at least one hilarious moment. Phone conversations provide great opportunities too. Like the time I casually mentioned to a friend on the phone that I didn’t call her to cancel a proposed meeting between us and an expat friend I wanted her to meet because he had died. I followed this with profuse apologies for forgetting to tell her sooner, that it had just slipped my mind. "My friend couldn't meet us...he died." “Se murió! ?” (“He died?!) asked my understandably horrified friend. Yes, I said. It was terrible. He had really swollen up in the hospital during the ordeal too, I elaborated. The fact that my friends continue to accept the smiling yet slightly incredulous expression on my face that I've learned to convey anything from surprise to compassion when I truly don’t know what’s going on and still remain my friends endears yet amazes me. I am beginning to understand how men must feel all the time trying to figure women out. Mexican women, thank god, are talkers. I like talkers. You know where they stand. Their occasional stream-of-conscientiousness dialogues always reveal golden nuggets about them without the patient digging and delicate inquiry some people need to get them to open up. I've never had an awkward silence when talking to a Mexican woman. In moments like these, as a language student I find myself pondering the sentence structure as much as the content. Seriously. I don’t know why they put up with it. Related: Reading as well as speaking can be unexpectedly titillating, as I learned when I read my first Mexican emails. If you're learning Spanish, you'll hear the word "cajones" alot. Here is a very funny, yet erudite explanation all its uses. Next up: More Uber confessions. Most recent: Bourbon, egg-timers and cooking in Mexico. Hola, I am a partner with Ventanas Mexico and author of "If Only I Had a Place," a complete guide to renting in Mexico for potential expats. This guide will enable you to know the pitfalls and the cultural factors that affect the whole rental process, which is very different in Mexico. The book also has a listing of rental concierges representing the most popular expat areas. 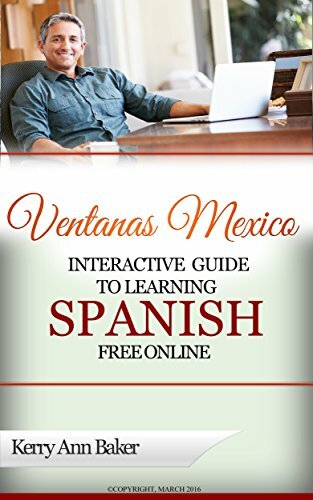 My first book, the "Interactive Guide to Learning Spanish Free Online," a curation of the best free teaching tools on the web along with suggested lesson plans. These are tools you are not likely to find on your own, that you can use to create a unique lesson of reading, speaking, writing and listening every day.